Local schoolchildren explore the wonder of the forest and learn about its different values so that they develop a better environmental knowledge and appreciation. The crowd of children take a step back as our senior researcher Lawrence Whittaker pulls a snake out of a bag. They’re grinning with excitement but their arms are rigid at their sides. Lawrence explains that the team found the snake while out surveying late last night, as part of the long term research into amphibians and reptiles here at the Manu Learning Centre (MLC). He stresses that the snake isn’t venomous and won’t bite, it’s completely harmless. You can even touch it. One arm reaches out from the back of the crowd, as a girl timidly stretches out a finger to stroke the cold scales. Next the schoolchildren are chatting to Claudia Pérez, a Peruvian bat researcher who’s spending three months surveying the weird and wonderful species of the reserve. She shows the eager crowd photos from last night’s activity – the fangs, the huge pointed ears, the bizarre skin folded noses. The children’s faces are a picture of amazement: eyes wide, jaws dropping. 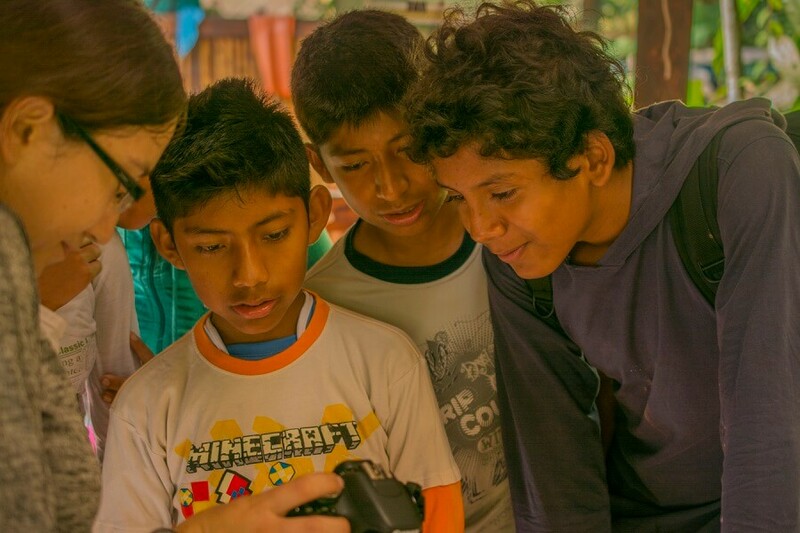 This is how the latest Rainforest Experience Day began, with the students getting up-close to species they’ve never seen, even before leaving camp and stepping into the forest. Before long they’ll be running up and down the forest trails, capturing an array of glittering butterflies and carrying out their own data collection. Their first hands-on experience of scientific research. There will be a lot of firsts today. 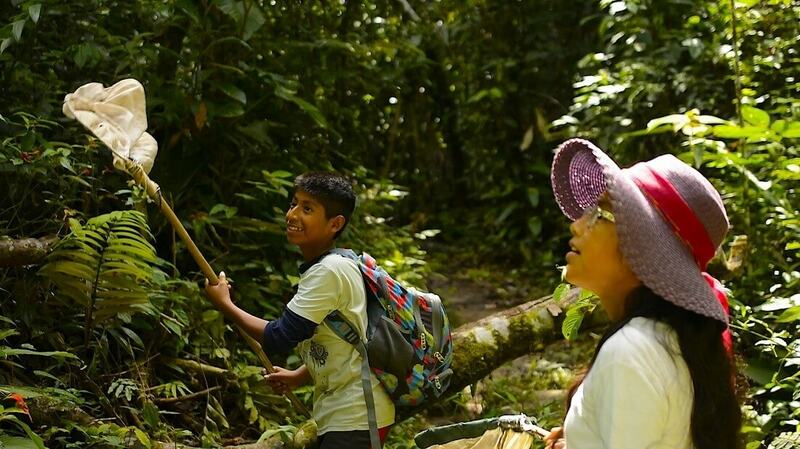 It may seem strange that children who live in the Amazon and especially here in the Manu Biosphere Reserve, one of the most biodiverse places on Earth, are not familiar with their local wildlife. In fact, for many, this is their first time exploring the forest. 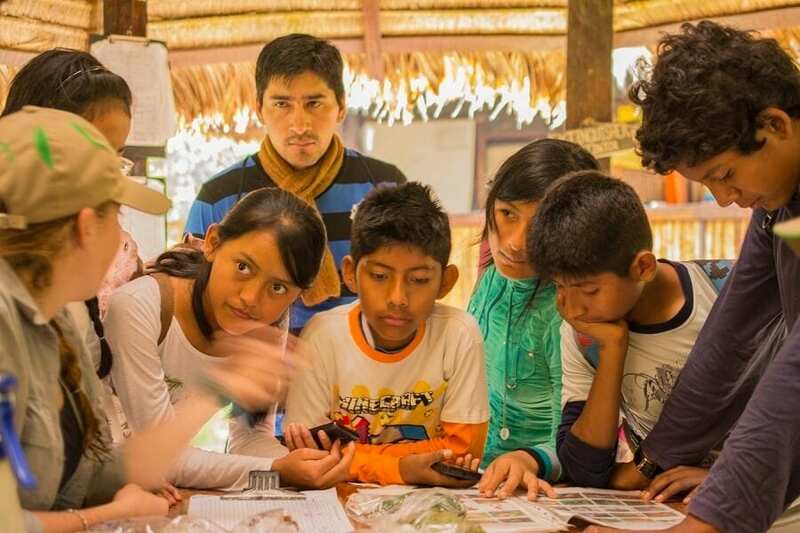 “We run environmental education for the local community mainly because the families from the local town of Salvacion are not from this area, they’re not from the jungle”, explained our education coordinator, Johanna Markiewitz. The community moved from the Andes to the Amazon during the 1960s and 70s when there were grants to buy cheap land. They came to take advantage of the rainforest’s wealth of natural resources – mining for gold and gas, logging for timber, converting the forest into agricultural land for crops and cattle rearing. Not only is this critical from an environmental perspective but also from a social and economic one. Using the traditional Andean agricultural techniques simply doesn’t work in the Amazon. Based on their Andean knowledge, many people then turned to slash and burn, a hugely damaging agricultural practice of clear cutting and burning the land. As part of our work here at the MLC, we help the community move away from this agricultural technique and set-up agroforestry plots, whereby they grow banana plants among a variety of hard and soft wood trees. This provides a more complex habitat for wildlife, keeps the nutrients in the soil, as well as providing the community with quick financial gain through selling bananas and long term financial gain through selling timber. The aim of the Rainforest Experience Days is to show the schoolchildren the different values that the forest can have. Our ethos is to not preach to local people, but instead to point out and provide alternatives. The MLC is the perfect place to do this, as it was once used as agricultural land, for growing crops and rearing cattle. It was then turned into a protected area and the forest has been regenerating for 30 to 50 years. The value of the land is now as a site of scientific research and ecotourism. We want the children to feel a sense of pride because they live in a place that’s of global importance and they can play a critical role in its protection. We are looking to inspire the next generation so that they become ambassadors for conservation within their community. “Our end goal is that in 10 or 15 years time, all these small experiences in the forest will inspire kids to ask more questions about policies that impact the environment or activities that are happening in their communities,” said Johanna. 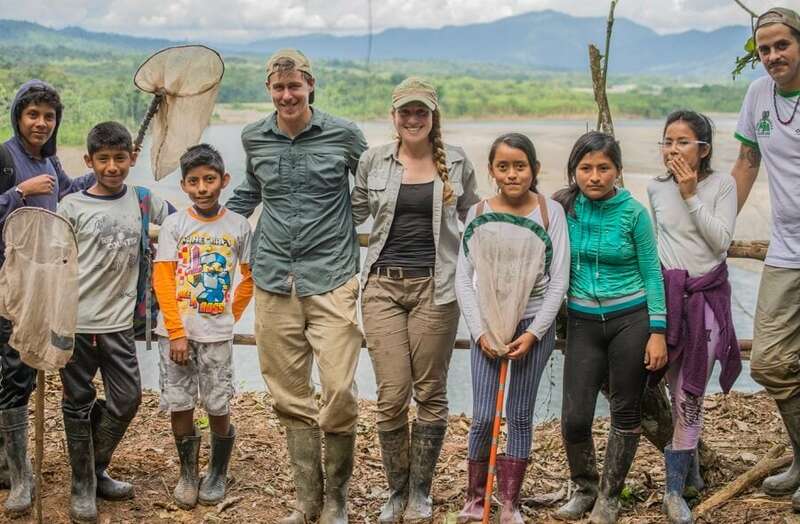 The long term aim of our education programme, both for local students and international visitors, is to encourage independent, critical thinkers who can make informed decisions based on greater environmental knowledge and appreciation.